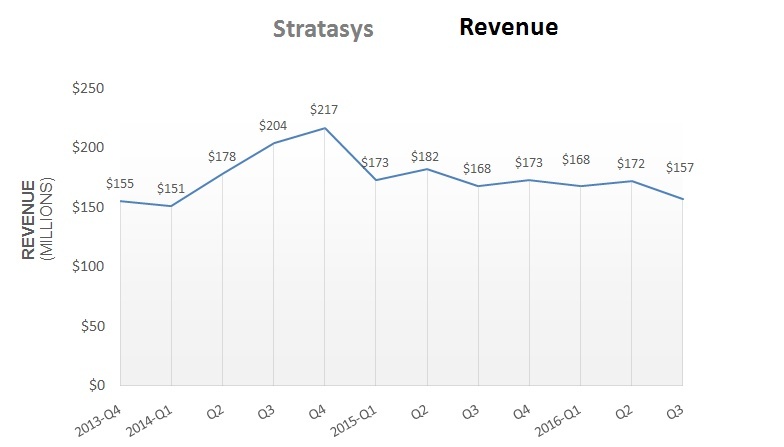 MINNEAPOLIS, MN and REHOVOT, Israel, Nov 15, 2016 – Stratasys Ltd., the 3D printing and additive manufacturing solutions company, announced financial results for the third quarter of 2016. Revenue for the third quarter of 2016 was $157.2 million, compared to $167.6 million for the same period last year. GAAP gross margin was 46.9% for the third quarter, compared to a GAAP negative gross margin of 47.7% for the same period last year. Non-GAAP gross margin was 54.0% for the third quarter, compared to 50.8% for the same period last year. GAAP operating loss for the third quarter was $19.4 million, compared to a loss of $931.3 million for the same period last year. Non-GAAP operating income for the third quarter was $3.3 million, compared to non-GAAP operating loss of $10.0 million for the same period last year. GAAP net loss for the third quarter was $20.8 million, or ($0.40) per diluted share, compared to a loss of $901.3 million, or ($17.35) per diluted share, for the same period last year. Non-GAAP net income for the third quarter was $0.1 million, or $0.00 per diluted share, compared to Non-GAAP net income of $0.7 million, or $0.01 per diluted share, reported for the same period last year. The Company maintains $239.3 million in cash and cash equivalents as of the end of the third quarter. Net R&D expenses for the third quarter amounted to $24.0 million, representing 15.3% of net sales. GAAP EBITDA for the third quarter amounted to $3.5 million. Non-GAAP EBITDA for the third quarter amounted to $12.0 million. 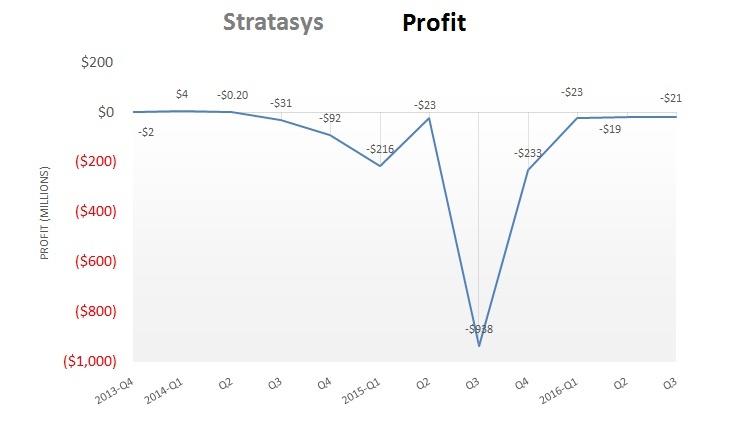 A complete chart of the financial results is available here. The company plans to hold the conference call to discuss its third quarter financial results on Tuesday, November 15, 2016 at 7:00AM (ET). The investor conference call will be available via live webcast on the Stratasys Web site at www.stratasys.com under the “Investors” tab; or directly at the following web address: http://www.thomson-webcast.net/m/p/cet5hgis. To participate by telephone, the domestic dial-in number is (855) 319-2216 and the international dial-in is (503) 343-6033. The access code is 96601880. Investors are advised to dial into the call at least ten minutes prior to the call to register. The webcast will be available for 90 days on the “Investors” page of the Stratasys website or by accessing the provided Web address. For more than 25 years, Stratasys Ltd. (NASDAQ:SSYS) has been a defining force and dominant player in 3D printing and additive manufacturing – shaping the way things are made. Headquartered in Minneapolis, Minnesota and Rehovot, Israel, the company empowers customers across a broad range of vertical markets by enabling new paradigms for design and manufacturing. The company’s solutions provide customers with unmatched design freedom and manufacturing flexibility – reducing time-to-market and lowering development costs, while improving designs and communications. Stratasys subsidiaries include MakerBot and Solidscape, and the Stratasys ecosystem includes 3D printers for prototyping and production; a wide range of 3D printing materials; parts on-demand via Stratasys Direct Manufacturing; strategic consulting and professional services; and the Thingiverse and GrabCAD communities with over 2 million 3D printable files for free designs. With more than 2,500 employees and 1,200 granted or pending additive manufacturing patents, Stratasys has received more than 30 technology and leadership awards. Visit online at: www.stratasys.com or http://blog.stratasys.com/. This entry was posted in CAD-CAM-CAE, Featured News on November 15, 2016 by Sharmila Guha.